Probably all I need to say right now is captured in this picture. That's the view I woke up to yesterday morning. I believe I gasped out loud when I opened the blinds. We had arrived at our hotel after dark Thursday night, so I didn't realize what was outside the window until the sun breached the horizon again. Here’s another view, looking more to the south (and a little later in the morning). That’s the quintessential Up North picture right there. 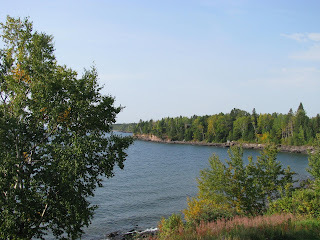 Lake Superior. Granite cliffs. Rock beach. Pine trees. Corey and I met up here, leading a group of teenagers on a canoe trip 20 miles into the wilderness. Natalie’s middle name evokes this area. It’s one of my favorite places in the world. And right now, it's leaf-changing season. I took that picture on a hike yesterday, which deserves its own post. (Lots of unexpected animal sightings.) But I don't have time to tell stories at the moment. We're on our way to get one of The World's Best Donuts. What kind would you like me to pick up for you? Did you see a bear???? And the World's Best Donuts? You're killing me. Are you eating wild raspberries??? I think I'm mad at you. Of course I'm kidding, but I sure wish I was there! I kind of hope you saw a bear, cause I'd love to hear that story. Yum, doughnuts :-) I never met one I didn't like! Wow! The pictures are beautiful. What's Natalie's middle name? Blueberry, please. And while you're taking requests, middle GA needs a blast of cool air. Would you please place a fan in your window, point it my way, and turn it on high? P.S. Glad that you're having a good time. our family lived in ohio for a few years before moving back down south. i really miss the gorgeous leaves in the fall. our fall lasts like 2 days here - the leaves just don't get as beautiful! 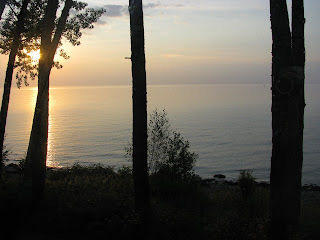 I've been to Bayfield, so I know how beautiful it is up there. Can't wait to hear about it! Um, I think I'd like an old fashioned glazed donut, please! These pictures are lovely! One thing we don't get in California is leaves like that. What is Natalie's middle name? Your pictures are lovely and make me want to visit the area again. How very peaceful it looks. Pick me up any donut. Might as well have it wrapped in bacon. And deep fried again. Just sayin'. Thanks for the pics! When I saw the one of the leaves changing I thought, Be Still My Heart! I so love fall. 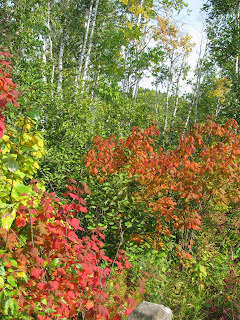 We won't see leaves changing until late October/early November here in my part of the world. Just their plain cake donuts are the best! I love love love them. Grand Marais, eh? This is really bizarre--my comments aren't showing up with any punctuation. So sorry if they actually get posted that way. Wish you were still there so I could ask you to pick me up a dozen or so...yum!